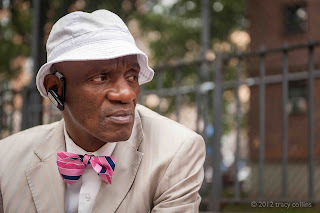 For one intense day in August 2006, Umar Jordan, a streetwise black man from the ‘hood--an ex-con turned handyman, youth worker, and community organizer--was as eloquent an exponent for Atlantic Yards as anyone, baiting opponents whom he claimed didn’t care about the real Brooklyn. “If you haven't been to Brownsville or East New York, Flatbush, you not from Brooklyn," Jordan pronounced at a charged public hearing, "you just visiting." The room, hot and crowded with more than 800 people, erupted in roars. Jordan was a bit of a mystery guest: he had not previously spoken up in the Atlantic Yards debate and soon vanished from it. Still, his bravura performance was such that, three months later, in a New York Times article, Perspectives on the Atlantic Yards Development Through the Prism of Race, Jordan’s speech provided the lead anecdote, albeit with no more information about him. Today, however, Jordan is bitter and angry about Atlantic Yards, seeing little impact on those “real” Brooklyn communities he knows, with few of the many promised benefits delivered. He’s a huge basketball fan, but Jordan says he’ll never attend a Brooklyn Nets game. "They played Brooklyn, they played all of us," Jordan declares, with characteristic certainty. "We just got shook. Game over. We got played. The whole of Brooklyn got played." Jordan, it might be argued, got played somewhat himself and might be experiencing some sour grapes. But he doesn’t see it that way. And the story he tells illuminates just how "community" support got promoted. 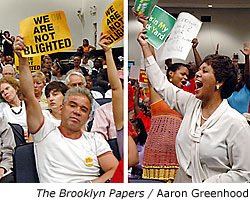 Over the nearly nine-year Atlantic Yards saga, the most unpredictable, powerful drama unspooled August 23, 2006, when, thousands of people converged on New York City Technical College in Downtown Brooklyn for what was billed as a hearing on the Draft Environmental Impact Statement but instead became a passionate referendum on the promises and perils of an arena and 16 towers. The auditorium was not nearly large enough to cram in the construction workers, project opponents, project supporters, and just plain citizens who wished to attend, leaving many marooned outside. For hours, the room vibrated with cheers and boos, Brooklynites venting for themselves and for the press, as developer Forest City Ratner, and its government agency partners watched in the background. Warring camps waved signs: “Affordable Housing Now” vs. “Ratnerville Unmitigatible.” The vending machines emptied early. Even boilerplate statements by project consultants about the enormous scope of Atlantic Yards provoked applause, and the energy amped up when partisans took the podium. The Rev. Herbert Daughtry, veteran church leader and head of a Ratner-funded community group, triumphed over the laws of physics by stretching his allotted three minutes into nearly six, delivering as stirring a sermon as his House of the Lord ever heard. Then a warning came from Jonathan Barkey, a short, wiry photographer, who wrestled into view new poster-size renderings of the project's massive scale from a street perspective--views not provided by Forest City or the state--hushing the crowd into awe and dread. The mood tamped down when an outsider of sorts, Tal Barzilai, a young man from suburban Pleasantville, uttered skepticism of development built on his observations of the World Trade Center. The moderator, careful to alternate professed opponents and supporters, called Jordan. "Where Brooklyn at?" began Jordan, then 51, with a lean build and a powerful delivery, echoing a line from the oversized rapper Notorious B.I.G., slain at 24, who never got the chance to move up and out. Jordan easily provoked a response: after all, he’d pulled some 300 people, including those who’d played in basketball tournaments he’d organized at housing projects, the buses supplied by Forest City. "My name is Umar Jordan and I represent My Brother’s Keepers," he declared, speaking without notes, a street preacher without portfolio. He referenced an informal organization--as he explained years later, when I interviewed him--aimed to keep young people off the streets, to avoid the path he took a young man, robbing drug dealers and going to prison, a rite of passage for so many from Brooklyn's tougher neighborhoods. "I heard a lot of people come up to this microphone saying that they're from Brooklyn and they've been in Brooklyn,” declared Jordan, a veteran at neighborhood vigils in the wake of persistent urban violence. “I'm here to speak for the underprivileged, the people that don't get the opportunity to work. The brothers that just came over out of prison, yeah, you know, wants to get a job too." The crowd, especially his followers in the orange shirts, responded. 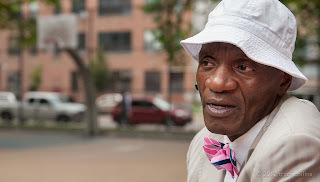 He had just spoken at an event sponsored by the New York State Association of Minority Contractors (NYSAMC), a signatory of the Atlantic Yards Community Benefits Agreement (CBA), which developer Forest City Ratner claimed would guarantee job training, local hiring, and minority contracting. 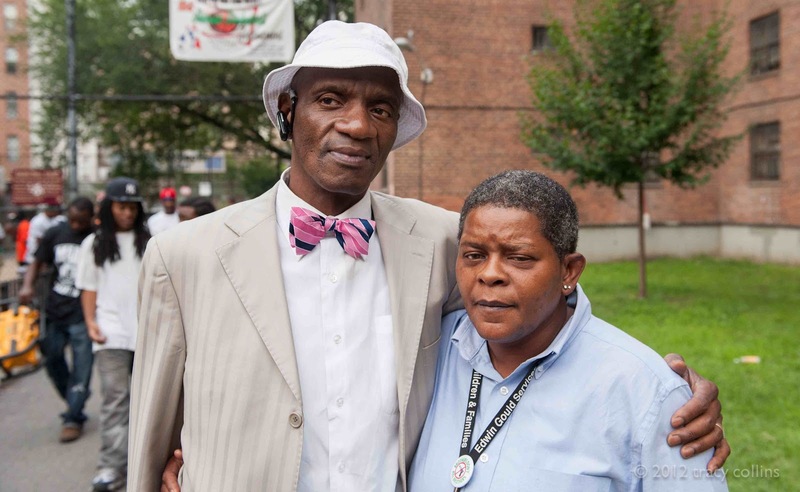 Not only did the NYSAMC and Forest City supply buses for Jordan to draw people from Bedford-Stuyvesant, Brownsville, and New Lots, they prudently provided MetroCards for those unwilling to stick around; after all, the event ultimately stretched eight hours. "For the people... that say they represent our community,” declared Jordan, “this is Brooklyn." He began a rhythmic challenge to further hook the crowd. “If you haven't been to Betsy Head pool [in Brownsville], you ain't from Brooklyn,” Jordan continued. The irony, of course, was that Forest City Ratner officials, and surely the new market-rate residents of Atlantic Yards, would have no need to explore these rough neighborhoods, far from the Central Brooklyn project site. For those "unpleased with the behavior of Brooklyn," Jordan added, with a dig at his predecessor at the podium, "I suggest you go back up to Pleasantville or wherever it is." Jordan disappeared from the Atlantic Yards debate, though he popped up in the news occasionally, appearing at prayer vigils for young people whose lives were cut short and, following the lead of the one elected official he respects, activist Council Member Charles Barron, even testifying against the entry of low-wage Wal-Mart. 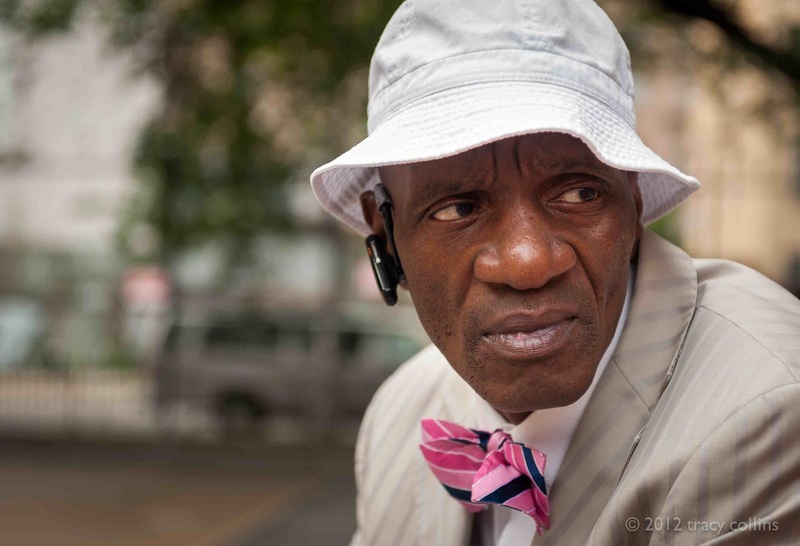 Five years after that 2006 hearing, when I first caught up with him, Jordan had grown frustrated with Atlantic Yards. He admits he didn’t know much when he walked in the door at New York City Tech. "The stadium sounds like a good idea," Jordan recalls thinking, when I first interview him in the summer of 2011. "And I find out, it could bring [construction] jobs, lower income housing." Before Jordan left the hearing room that night, a crowd of "white guys" from the Plumbers union "bum-rushed" him with enthusiastic praise. But he emerged feeling uneasy, saying he saw people accept money not merely for their organizations but for themselves. "Inside that room there was a lot of b.s. going on, there was a lot of exchanging of favors for monetary gains," he says. "None of that interests me." Jordan won’t name names or provide details, though he indicates one recipient had passed away. I mention Darnell Canada, a prominent project supporter who died in May 2011. Jordan neither assents nor dissuades me. Jordan did want something from Forest City, he says, though not for himself: some of the money he heard the developer was spreading around for community projects. He put in a request for support--some $3500 for a basketball tournament at Marcy, involving equipment, clothing, and trophies. But Jordan says his bitterness isn't personal. Over the years, as Jordan saw idle youth at Marcy and knew no one working at the project, he became angry. "The major demolition companies. Why is the phone on the truck a 516 [suburban Long Island] number?" he asks. In July 2011, Jordan showed up at a demonstration outside the arena run by People for Political and Economic Empowerment (P.P.E.E. ), a "construction coalition" including numerous ex-cons. Members of P.P.E.E., founded by Darnell Canada and allies, had protested disruptively for Atlantic Yards as late as 2009, but, two years later, they’d grown frustrated by the seeming absence of jobs and contracts for locals. 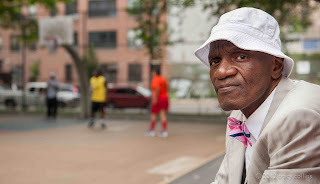 One day this past August, Jordan arrives at the Marcy basketball courts wearing a white “bucket hat” for shade over his shaven head, a pink and black tie, and a striped suit, worn at the cuffs. (He lives across the street.) He says he's been looking for work for months. Still, his phone buzzes so often he leaves his earpiece on. This day he’s been in Downtown Brooklyn, helping a kid arrested for disorderly conduct get the case dismissed. 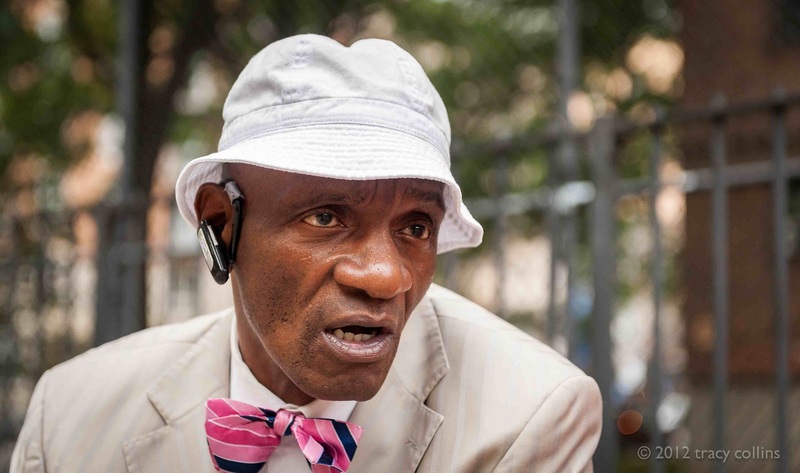 He’s been getting calls from public officials and anti-violence advocates about a vigil in Crown Heights after a shooting. He laments that elected officials and clergy like to visit places like Marcy but don’t deliver. So he pawned his jewelry--reaping $780, he says--to help pay for the “Marcy on the Rise” hoops tournament running all summer. “It’s not basketball, it’s a safe haven,” Jordan declares, saying the tournament cuts down violence at Marcy over the summer. He tries to remonstrate with kids who have far more attitude than hope, so frustration and slights boil into turf battles. Jordan has mellowed, he admits. He grew up from a “productive household” but in his late 20s began robbing drug dealers to sponsor a basketball camp, a path to prison. “I decided to let God have his way, it changed me, made me a better person,” he recalls. He took the name Umar when he became a Muslim at 28, a reference to the second caliph, a warrior for justice. Jordan says he served a bodyguard for the Rev. Al Sharpton in several high profile, racially charged cases around New York, involving such figures as Alton Maddox, Eleanor Bumpers, and Tawana Brawley. What martial arts does he know? “Karate and Ka-razor,” he quips, referencing a James Brown song. Sharpton, I tell him, supports Atlantic Yards. Some in the black community--like James Caldwell of the job-training group BUILD and the Rev. Daughtry--have a piece of the Atlantic Yards action, I point out. They signed the CBA, have gotten financial support from Forest City Ratner for their organizations, and still promote the project. “We’re not looking for a handout,” he says. “We’re looking for an opportunity.” That may sound like a cliche, but that's why Jordan showed up six years ago to take the podium so effectively. A terrific piece. Thank you. Well done! Balanced and painfully honest. Thank you.